dreamGEAR Launches Wii Soft Sport Kit | OhGizmo! 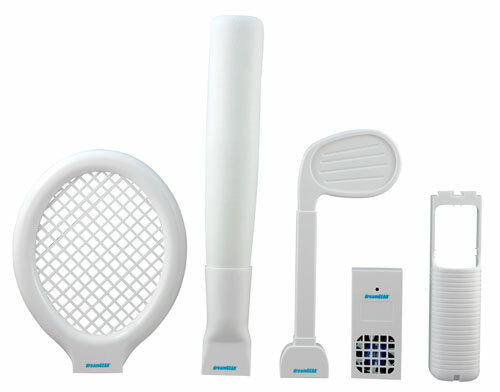 dreamGEAR announced a new Wii accessory today called the Wii Soft Sport Kit that includes soft foam bat, golf club, and tennis racket. Bonus items in the kit include a Wii fan to help keep your system cool and a Wii remote glove to give you a better grip. Any parent who has played Wii Sports with a couple kids can tell you that after a while, someone usually ends up getting bashed with this sort of sport kit. The good part about this is that when one gamer bashes another with the soft foam equipment the likelihood of someone being harmed is much less. Plus next time my hands slip while playing Tiger Woods maybe the TV won’t get killed. The price for the kit is $34.99 and it is available now. …but no matter how soft it is, I can’t justify spending $35 for something which has no functionality other than telling me which direction I’m pointing the wii remote, which is in no way a problem now.